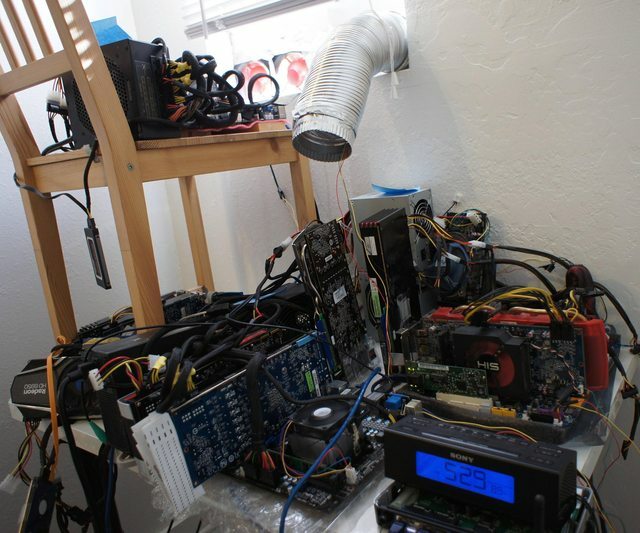 Back in 2012, you could still come out ahead mining Bitcoin at home on a computer graphics card — if you were super-careful with your budgeting on hardware and electricity, and knew when to upgrade and when to quit. and if the difficulty didn’t go through the roof at the next difficulty adjustment. So of course, foolish persons went all-in and bought new hardware to burn out that they could never pay off before it was obsolete! 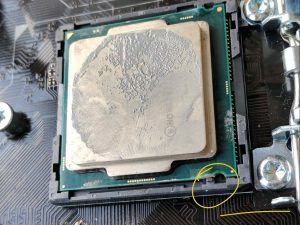 If you buy literally the wrong CPU for your motherboard … just push harder! As the bubble continues, Ethereum’s no longer easy to profit from, but various altcoins can often be mined on a graphics card at a positive return. It’s difficult and fiddly to work out what the most profitable mining mix is for any given day — so NiceHash sprung up, a service that would pick what coin to mine and sell your mined altcoin for bitcoins, taking a commission. All you needed to do was install their client software, run it as administrator, disable your virus checker … what could possibly go wrong? As it happened, NiceHash got hacked. $60 million in users’ bitcoins was stolen. 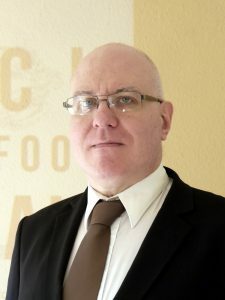 It also came out that the company was set up by a convicted hacker, though he swears his innocence. NiceHash swear they’re coming back. Most of their previous home miners have abandoned them, and other similar services are in such demand they’re running out of capacity. But they have their loyal fans. 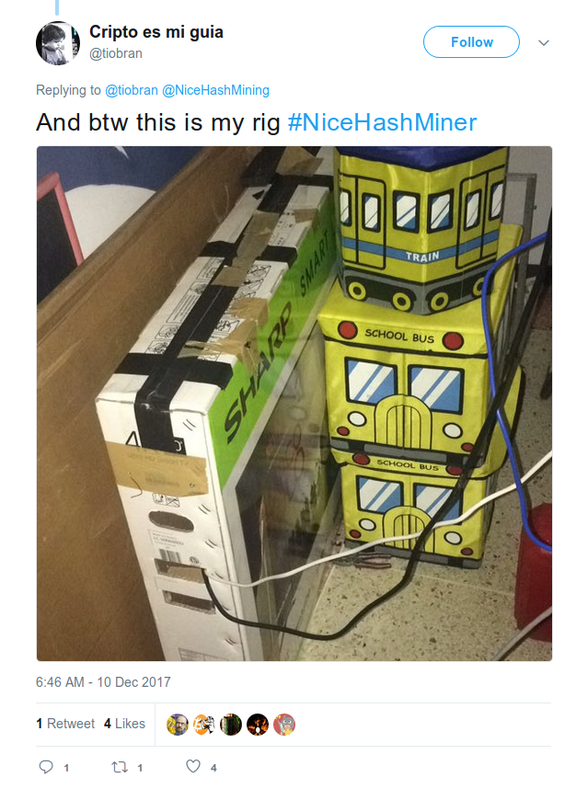 So NiceHash asked them to publicly show off their well-thought-out and robustly constructed mining setups, on the Twitter tag #NiceHashMiner! 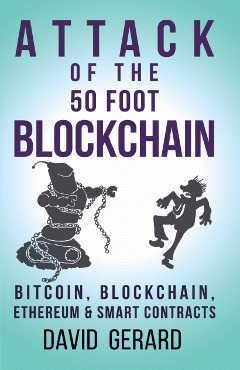 Collecting your NiceHash Mining Accident Futures for your convenience. Just push a bit harder! Free heat for the house? Seriously? 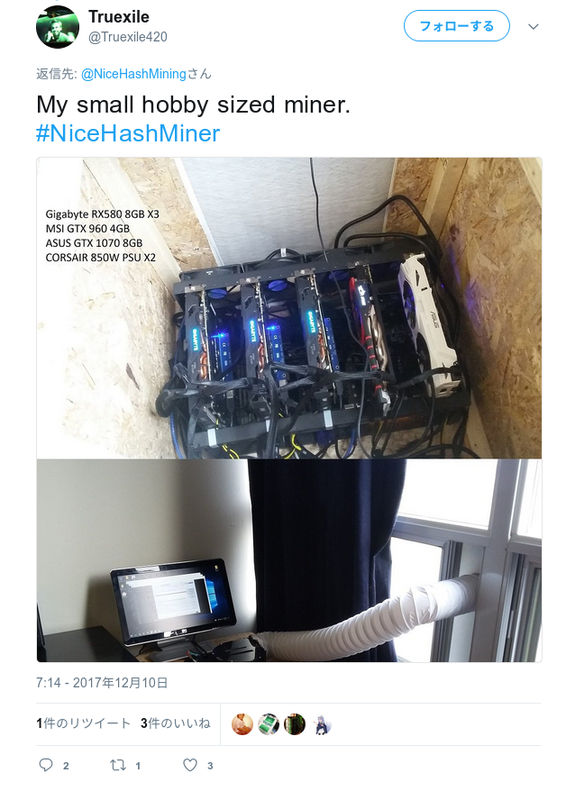 I wonder if he’d consider a bunch of electric heaters “free”, or if they’d be considered an appallingly expensive way to heat the house despite costing *less* than one of those rigs (because an electric heater costs less to buy than a high-end computing rig being used entirely to waste power computing useless hashes). Aside: I actually used a pair of those exact white standing fans to keep one of my machines cool, twelve years ago now — but it was an emergency measure, repurposing my bedroom fans after a CPU fan failure, and I only kept them on for a couple of days until I bought a replacement. Doing it as a permanent state of affairs is crazy. Certain student apartments here in Finland include electricity as a part of the rent, i.e. at flat rate. You can probably guess what has happened. Though the problem is still so manageable that the housing associations haven’t quite bothered to curb it, and at least up here you can legitimately say you have an use for the heat for about six months every year. And I thought I was being clever when I sketched a small water turbine to be attached to the water faucet at my student pad, back when water was included in the rent and I had access to university machine shop.